If you feel that this has been a very hot summer then you’re right. In fact this last twelve-month period is the warmest ever recorded in the U.S. according to the National Oceanic and Atmospheric Administration. To escape the heat of July and August, residents of overcrowded cities throughout the Northern hemisphere abandon their homes and flock to the nearest beach resorts. Over the last several years something else has been gathering to welcome the tourists: the jellyfish. Much media attention has been given lately to the sometimes-disastrous increases in jellyfish population, known as “blooms.” In October of 2009 a 10-ton fishing trawler sank when it tried to haul in a net full of giant jellyfish in an effort to clear the sea of these creatures. In June of 2010 a nuclear power plant in Torness, Scotland was forced to shut down because of jellyfish clogging its cooling system. Last summer an invasion of moon jellyfish prompted Southern Florida beaches to post dangerous warnings to swimmers. Much of this media coverage blames global warming and overfishing of finfish for these sudden jellyfish blooms. When I contacted Dr. Robert Condon, senior marine scientist at Dauphin Island Sea Lab in Alabama, he told me that these sensational media accusations may be premature. He said that “there is much debate on the issue of whether jellyfish are increasing or not.” Currently there is just not enough data to form any conclusion. But Lucas Brotz, a doctoral candidate at University of British Columbia specializing in jellyfish research, told me, “even with all the uncertainty, it does appear that coastal locations most impacted by humans are the same places showing increasing jellyfish populations.” Three years ago Dr. Condon and other marine scientists around the world formed a global working group to collect relevant data to explain the blooms. So how does this issue impact jellyfish as a food source? People in some Asian countries consume jellyfish as delicacies and the Chinese are especially fond of them. But is edible jellyfish population sustainable? Should we be worried about consuming them? According to Professor Shin-Ichi Uye of Hiroshima University the most popularly harvested jellyfish is the sand jellyfish (Rhopilema esculentum) and they are heavily harvested in Asia. However Chinese marine hatcheries are beginning to grow jellyfish larvae and release them into the coastal waters of China. Still, Brotz cautioned that the success of this practice is being debated. For now though Dr. Condon and Professor Uye are comfortable in recommending continued consumption of these jellyfish. The benefits of eating jellyfish are also rather controversial. Dr. Condon believes they are a healthy food choice containing 5% fat and 80% protein. Brotz on the other hand maintained that the protein content is rather low and he also identified aluminum residue, which contaminates jellyfish during processing, as a health concern. Some Asian research suggests that consuming jellyfish collagen, which is the main protein in jellyfish, can benefit people suffering from rheumatoid arthritis. But no formal scientific conclusion has yet been made. Jellyfish is rarely absent in celebratory Chinese banquet event, be it a wedding, birthday or business banquet. I regularly serve jellyfish at my Chinese banquets. 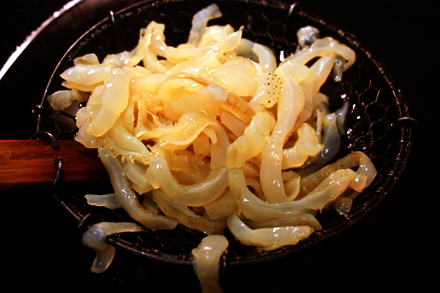 Jellyfish salad, often part of the first course, is made from the bell (海蜇皮). 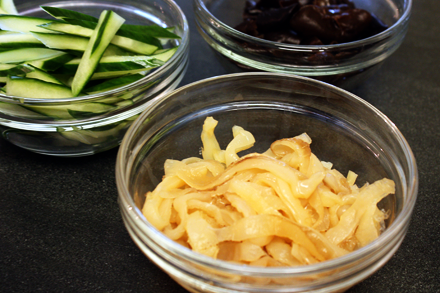 The thin round sheet is cut into strips resembling noodles and combined with cucumbers or other crunchy vegetables before being dressed in a fragrant garlic, black vinegar and sesame oil sauce. 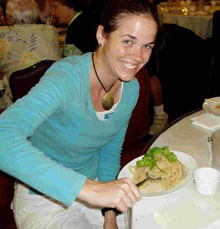 Another part of the jellyfish used to make cold dishes is the oral arms, known in Chinese as “jellyfish head” (海蜇頭). These coral shaped arms sit below the bell between the mouth and the tentacles. The oral arms are often sliced thinly and served icy cold with a side of black vinegar for dipping. 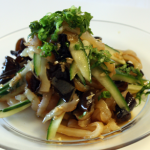 If you’ve not tried eating jellyfish then let me suggest the following recipe made with the jellyfish bell combined with wood ear mushroom and cucumber. You will find that the jellyfish will take on the delicious flavor of the dressing and contribute a crunchy texture to the dish. It will not be slimy or slippery, as you might imagine. Jellyfish, whether the bell or the oral arm, are salted and dried for storage before being sold in the market. So it is important to soak the jellyfish in clean water to remove the salt. 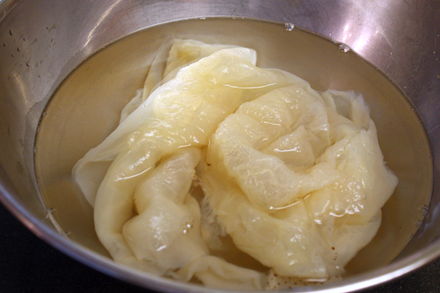 Soak the jellyfish in about three cups of water and refrigerate for six hours. Drain and replace the water after two hours and again after four hours. Drain the jellyfish and squeeze out as much of the water as possible. Slice the jellyfish into strips about 1/4 inch wide. In a pot or a wok heat enough water to submerge them. Bring the water to a boil and turn the heat off. Let the water cool for about two minutes or until the temperature reaches about 190 degree F. Put the jellyfish noodles in a spider skimmer and submerge the jellyfish in the hot water. Use a pair of chopsticks or large spoon to stir the jellyfish until completely blanched or about 30 seconds. The jellyfish noodles will shrink and become thinner and shorter. Drain and let cool. Refrigerate the jellyfish when cooled. Prepare the sauce by mixing all the ingredients together. Set the sauce aside until ready to serve. Just before serving squeeze any extra water out of the jellyfish and toss them together with the wood ear mushroom and cucumber in the sauce. Mount the salad on a plate and garnish with minced scallion and cilantro. I love cold dishes very much especially in summer and even in winter. I do not use seafood frequently but I will try to make some in near futher. I’m a big jellyfish fan. Love the crunchy texture and clean taste. 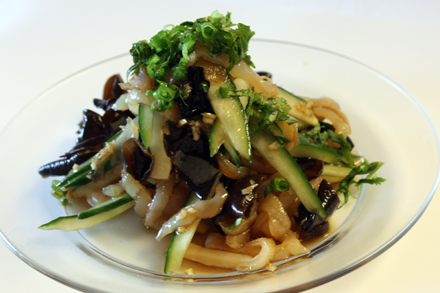 Jellyfish is such a wonderful dish, especially when served cold and spicy! Have you thought about adding chiles to the mix? Anyway, I’m part of another foodie blog. Feel free to check us out http://www.eatyourworld.com! what brand of jellyfish do you buy? I usually buy them from the seafood section of a Chinese market. They are sold as bulk products and I just select the pieces that is firm and clean. Honolulu. They can sit like that for a very long time with no refrigeration needed. After soaking it in water to remove the excessive salt for 2 days, I like to add a little fish sauce and a spicy “Satay” sauce a Vietnamese type spicy oil sauce, and a little sesame oil, serve cold and eat it while drinking beer. Everyone loves it! Try it out you’ll love it! Thanks, I got some salted jellyfish today and was wondering about that. I’ve already prepared some, but the rest I’ll soak longer. I just rinsed it and soaked it for a few minutes and it’s way too salty. I need to ask the seafood section next time if they have some fresh. Yes, you do have to soak the jellyfish for a long period. I recommend at least 5 hours and change the water every hour or so. Jellyfish is transported salted so you will have to soak to use it. Unless you can find a good butcher shop in Chinatown that already soaked, cut and blanched the jellyfish. My 12 year old son and I were at a Chinese market and they were handing out samples of jelly fish. I gave him a sample and told him to try it. He LOVED IT! I bought several packages and he ate them all. Jelly fish is DELISCOUS! I just thawed a frozen pack of jelly fish and tossed in the bit of Chinese Vinegar, Sesame Oil and mildly hot spice packs that came with it. Fried it will the excess water evaporated and added two beaten eggs. Made a very good omlette. Better if I had added green onions I think. I experienced eating jellyfish for the first time at a fabulous seafood banquet in Hong Kong. The meal included lobster tails which I think must have been poached in coconut milk, rolled in demerara sugar and then roasted in a gas flame. Also, huge boiled limpets about 2″ across, which I was amazed to watch Chinese people eat with chopsticks – they are very slippery! The jellyfish was served without any announcement to me. It looked like purple sliced French beans, and had slightly crispy texture but an astounding flavour. I recently asked at an oriental supermarket in Upper Bangor (Gwynedd), if they had Chimchi and any Jellyfish. I was quickly provided with both. The Chimchi was excellent, and the Jellyfish also – but rather different to the purple example I had in Hong Kong. This was light yellow, crispy, like lightly cooked cabbage, but the flavour came from two sachets of sauce. I understand that jellyfish is a perfect food almost zero carbohydrate, cholesterol, and fat. But high in protein. I would be very interested in how to harvest and prepare jellyfish from the British coast. 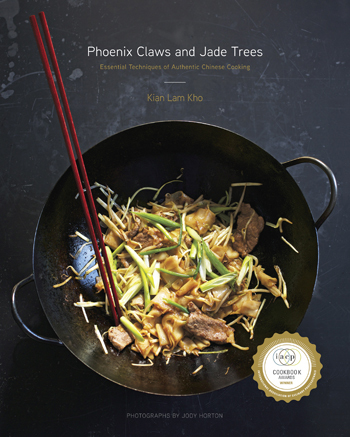 Check out this article to find out where to buy authentic Chinese food in D.C., including jellyfish. Thanks Andrea for the link to this nice article. I’d like to try it but so far I’ve been unable to discover whether the huge, dark purple, stinging jellyfish now in coastal waters and washed onshore of Prince Edward Island, Canada are actually edible. Can anyone tell me? It sounds like your talking about portugues man of wars. They are definetly not edible. I imagine you have a China town near? on them, and edibility or not. Do we really have to go after the Jelly fish now? They are absolutely fascinating to watch and beautiful. I can’t see myself being able to eat one. Was told by an older Chinese gentleman, a retired acupuncturist, that jellyfish are being touted as good “brain healing”food. Th main ingredient, if that is what it is, says. Prevagen. Actually this is how the clerk in the GNC store located the product. How many types are edible?